Have you ever tried to get your dog to sit still on a bathroom scale long enough to measure her weight? Not much fun — is it? 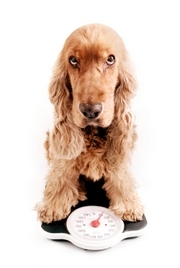 Nevertheless, to calculate a suitable dog food serving size, you must know your dog’s current weight. And voila! You’ve got your dog’s weight. By the way, if your dog is too heavy for you to comfortably hold in your arms, most vets will gladly weigh your dog for you. So, don’t be afraid to ask. Use our Dog Food Calculator to estimate your pet’s recommended portion size.